The Streets Department has decided to install minimal protection on 27th Street leading to the South Street Bridge. The flex-posts going in on 27th Street, which are supposed to be installed this month, will be a bare minimum measure and, given the area in which they will be placed, are likely be destroyed in a short period of time after installation. We proposed traffic separators for two reasons: First, Lombard and 27th is one of the most heavily used bicycle corridors in the City. The Bicycle Coalition’s counts have documented 225 bicyclists an hour on the South Street Bridge westbound during peak hours, making it the most-biked bridge in the State of Pennsylvania. Second, motor vehicles tend to accelerate up 27th to make the light at South. Given that 27th is the feeder street to the South Street Bridge and there is fast moving motor vehicle traffic on the roadway, we think 27th Street needs greater protection than only flex posts. Streets Department cited budgetary constraints for installing non-reinforced flex posts instead of flex posts with traffic separators, as the Bicycle Coalition originally recommended in its August 2017 letter to oTIS and Councilman Johnson and followed up with repeated requests this fall. 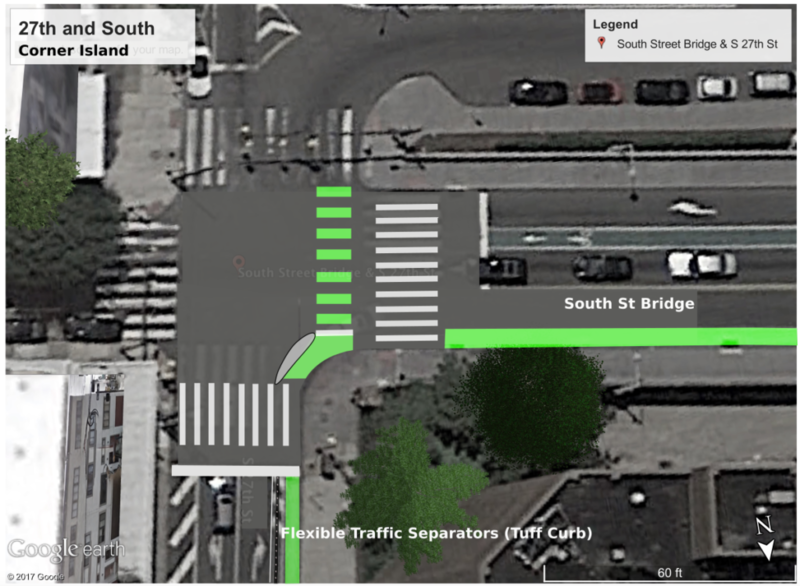 As readers of this blog will recall, SOSNA and Councilman Johnson approved protection for the 27th Street bike lane leading to the South Street Bridge, as well as separation for 27th Street to 21st Street coming off the South Street Bridge, in December 2017. Due to a Water Department project, installation took more than 15 months and, after an ordinance introduced by Councilman Johnson turning the bike lanes into “No Stopping” zones, flex post installation is finally ready. The Bicycle Coalition recommended Tuff Curb protection and a protected intersection at the corner of 27th and South Streets. Unfortunately, both of these options have been rejected. Tuff Curb would have done a better job restraining motor vehicles from encroaching on the bike lane along 27t Street as people driving their vehicles make the turn from Lombard onto 27th, than typical flex posts. Already, many flex posts have been destroyed along West Chestnut Street, leaving trash and blight on the corridor. It’s likely the posts on 27th Street will see a similar fate—and sooner—due to the curve from Lombard. Protection originally proposed by the City for Lombard was rejected in Summer 2017, meaning there that lane is getting no traffic calming protections leading up to the 27th Street protected bike lane.